Due to the large amounts of threads that players are creating I decided to place the solution here for easier finding. Credits go to hshmt for the solution. Source. To make things even easier I've also added screenshots for each step in spoilers. Please note these steps are for Windows operating systems, if you are using Mac some steps may be different for you. WARNING: Be sure to backup your WoTLauncher.cfg before attempting step 3. Go to your World of Tanks installation directory. For me it's found in D:\Games\World_of_Tanks (this may be different for you). In this tutorial I will be showing you how to edit it in Notepad++, but it's basically the same as using other text editors, such as Notepad. Look for the part where it says <item>http://update.worldoftanks.asia/ </item> (can be found on line 23 in Notepad++), you will notice that there's a space before the </item>, remove the space so it reads as . <item>http://update.worldoftanks.asia/</item> then click save. Run the launcher again and it should now update. If it doesn't, recheck to make sure there's no space before the <item>. 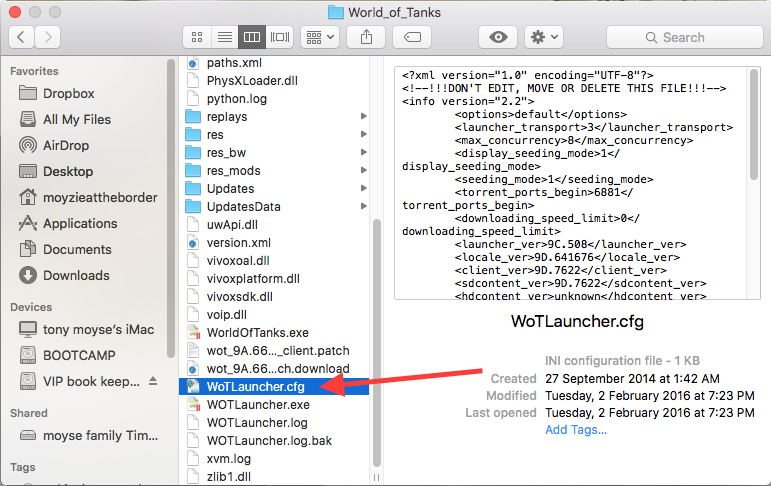 If there is no space, please paste your WoTLauncher.log in this thread which can be found in your World of Tanks installation directory. If you need further help, you can contact Support here: https://asia.wargaming.net/support/ be sure to also attach your WoTLauncher.log in your ticket so they can see what's wrong and assist you in fixing it. Now the question is why is there a typo, and why only some people have it. thanks for your instructions, but they are applicable to Windows programs, not on mac. Can you be good enough to assist us with macs. Just simply edit the WoTLauncher.cfg file in your World of Tanks installation directory like above. Many thanks for the above "blow by blow" "fix", I used Text wrangler for my MAC, a two minute download (FREE) a correction in the file and "good to go" Many thanks again, rounds now going down range "happy tanker"
Thank you, thank you, thank you. I used sublime text on my power book. All seems to be fine once more. Might add some key words: mac, critical error, connecting to update service, application cannot continue, update paused. Edited by 13alexander, 30 January 2016 - 08:47 AM. If this is WG error, won't a mini-patch solve this? Like Bluefunk said, how will a micro-patch fix something when you can't patch? This guide will fix it for them, and it's really simple to do. this post should be pinned..
You're welcome, glad it fixed it for you. Also, it is pinned. Can you try running the launcher as an administrator? I have found the same issue, I can edit it but it never seems to say in the edited format. I run the client, it fails, then I check the file only to despair when it is the same as before I edited it, even after saving multiple times. Edited by alexanderwhite, 03 February 2016 - 07:02 AM. You on an administrator account? Right click the file and go to Properties then click on the Security tab and see if you do have permissions to modify / write. A thing you could try is creating the file itself, so just copy the contents of the current file and then put it in a new one, then edit the file to make it correct and save it as WoTLauncher.cfg. See if that works. Thank you for your suggestion. I tried to create a separate file and moved the old one to a removable disk but, alas, this attempt failed... :-(. Im just wondering if I were to download the game in full again onto a different user, whether this would work? I will try it this morning, hopefully it will have worked by this arvo. You can try reinstalling it again. Let me know if it does work for you or if it doesn't. You asked me to inform you if it worked so here i am. Im glad it finally worked. Thank you for all the help you have given me. I really really appreciate it. Glad to hear it's working now. You're welcome. I have had this happen now 3 times since I have posted the thank you here. I use a iMac and installed with the wrapper not using parallels or a virtual machine. The first time was a bit of a headache but after downloading text wrangler and just slowly going through the lines I worked it out and found the line.. The second Time I used the same technique you have suggested here, then I tested something after doing it. I'll post the instructions here. For those that don't want to use a text editor or have the know how to edit files here is a simple way to restore your game. edit note: click the pictures to enlarge them I don't know why they are so small sorry. go back 2 or 3 update windows, or a day if you haven't been able to play for a while. 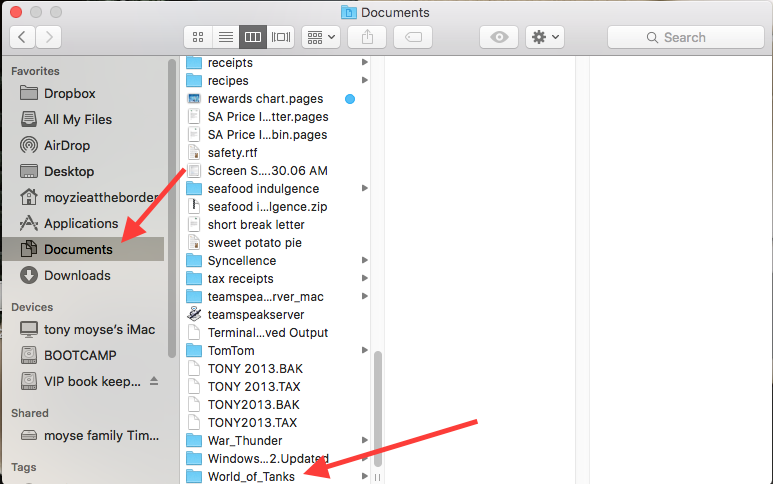 Your world of tanks folder by default is in documents, unless you installed some where else. open world_of_tanks folder and down the list of files find file WoTLaucher.cfg highlight it by single clicking it. Then click restore below the window. wait for it to finish replacing the file. Once it is finished you should now be able to play world of tanks. hope this helps the Mac users. Edited by moyzie, 08 February 2016 - 04:45 AM.